It seems that a lot of famous foreign actors and actresses really love the Philippines. They love it so much that they even put up their own stores here. I mean, there's Kenny Rogers, Cleopata and West Side Store. So it's not surprising that we've found another one. Our Store of the Week was a store put up by a once (very) famous blonde actress of Hollywood and the most desired woman of her time -- none other than Ms. Marilyn Monroe. She actually visited several years ago and liked it here so much that she decided to put up her own restaurant right in the heart of Sucat, Paranaque. 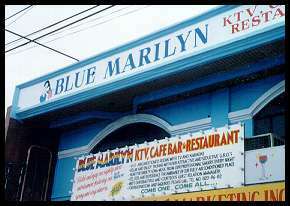 It's been very successful - so successful in fact that it's not only a restaurant, it's also a KTV lounge and bar. Oh, and did I mention that she loved fish?